It is quite simple really... 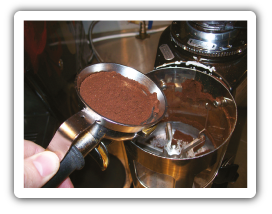 The Coffee Catcha acts as a funnel to stop the coffee beans from falling over the edge of the portafilter. It is then used to scrape off the excess grind (as the barista would usually do with their finger). Using the Coffee Catcha is also quite simple, trials have shown that it only takes a couple of days for the barista to get used to. 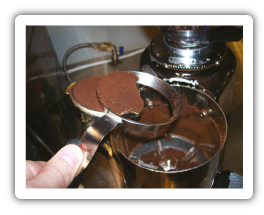 Watch this video to see the Coffee Catcha in action and the comparison without using it. The return on investment (ROI) to a cafe using 1kg of coffee per day is only a few weeks. For high production cafes the ROI is only a few days. With domestic and office usage, whilst the overall coffee used is often not a lot compared to a cafe, the biggest savings is in time spent cleaning up the mess. How did the Coffee Catcha come about? A lot of cafe owners said that wastage of ground beans was a problem, both with the mess that occurs and the fact that they 'must be' losing money from it. Espresso Corp carried out significant market research to find out that these two issues were in fact a pain throughout the industry. We then went about solving that problem through product development and trialling prototypes with experienced players within the industry — until the ideal solution was identified. Is the Coffee Catcha a brand new product? Does the Coffee Catcha work on all types of machines? 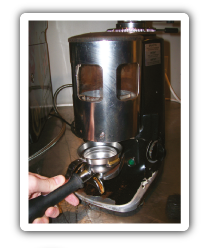 The Coffee Catcha fits most commercial espresso machines including most versions of Astoria, Brasilia, Faema, La Marzocco, Nuova Simonelli, Rancilio, VBM/Vibiemme and Wega. Other versions of the Coffee Catcha (including one that fits the La San Marco) are coming soon. Channelling is the uneven extraction of the water through the packed wad of coffee. Channelling occurs when the basket is not filled evenly allowing the pressurised water to follow the easiest path of resistance — or through the gaps in the coffee wad. Channelling results in poor quality coffee. The savings are blatantly obvious, there are no more massive piles of coffee under the grinder! 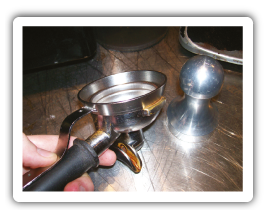 Before starting, make sure the Coffee Catcha fits on the portafilter. 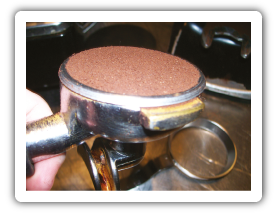 If the handle of the Coffee Catcha is not touching the portafilter, bend it down so that it makes contact with the portafilter handle.